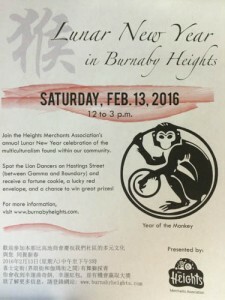 The Burnaby Heights Association is celebrating the Lunar New Year on Saturday February 13, 2106. Hastings Street comes alive with music and dance while celebrating the multiculturalism found within our diverse community. If you spot the Lion Dancers between Gamma and Boundary you can receive a fortune cookie, a lucky red envelope, and a chance to win great prizes. 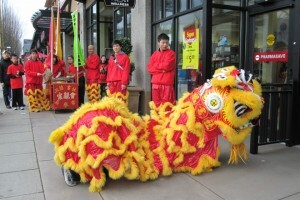 Traditional and colourful lion dancers perform special blessings to bring luck and prosperity to Heights merchants. Lucky Heights shoppers receive a fortune cookie and red envelopes, which contain special messages and the chance to win various Heights gift certificates!